In the latest move in a complex series of patent-related cases, Apple filed a motion in a U.S. district court late Friday to ban Samsung Electronics' Galaxy Tab 10.1 in the U.S. The Apple filing came in the wake of an appeals court ruling earlier in the week that sided with Apple on the validity of an iPad design patent. Meanwhile, Apple and Samsung are scheduled to go into court-mandated settlement negotiations, set for May 21 and May 22, so the injunction is not likely to be granted over the next few days. The motion for a preliminary injunction against the Galaxy Tab 10.1 was filed in the U.S. District Court for the Northern District of California, where Judge Lucy Koh is presiding over several cases involving Apple and Samsung patent claims for tablets and smartphones. 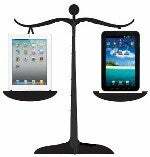 Koh had earlier in the year said that Apple was unlikely to win its patent claim against the Tab 10.1, siding with Samsung's contention that Apple's iPad-related design patent claim in question would be considered invalid. Samsung has said that aspects of the iPad design patent are too obvious to be patented. However, earlier this week, the Court of Appeals for the Federal Circuit sided with Apple on the likely validity of the iPad design patent. "While this Court had concluded that Apple had failed to establish likely success on the merits, the Federal Circuit held instead that Samsung had failed to raise a substantial question as to validity of the D'889 patent based on obviousness," Apple said in its motion to Koh Friday. In the motion, Apple pointed out that even though Koh had initially said that Apple's patent was likely not valid, she did agree that Apple would suffer harm from competition with the Galaxy Tab 10.1. In addition, Apple stressed that the appeals court also agreed that Apple would suffer from competition with the Galaxy Tab. "This Court should now promptly enter a preliminary injunction to protect Apple from the continuing irreparable harm that this Court found five months ago was likely to occur in the absence of such relief," Apple concluded. The Friday motion was first reported by Florian Mueller's Foss Patents blog. If the court-mandated settlement talks between the two companies fail, Koh could grant Apple's request for the injunction to be handed down without a hearing. However, Koh is scheduled to hear arguments on June 7 for a separate injunction Apple has requested, against Samsung's Galaxy Nexus smartphone. She could also hear further arguments on the Tab 10.1 injunction at that time, Mueller suggested. Apple sued Samsung last year for violations of multiple patents and trademarks in Android-based smartphones and tablets. Samsung has countersued. Apple filed a separate suit against Samsung this year on products released after the first suit was filed. Apple and Samsung are litigating about 50 different lawsuits in several countries. In Germany, a Dusseldorf court is set hear on June 5 an appeal from Apple, which is seeking an injunction preventing Samsung Electronics from selling the Galaxy Tab 10.1N, a tablet modified to beat an earlier injunction against the 10.1 version of the product in the country.